It’s Holiday time, and while I love to bake tortes, pies, cakes and cookies, I also love to create ice cream flavors. This one is Vegan, Non-Dairy and naturally gluten-free… and irresistible! 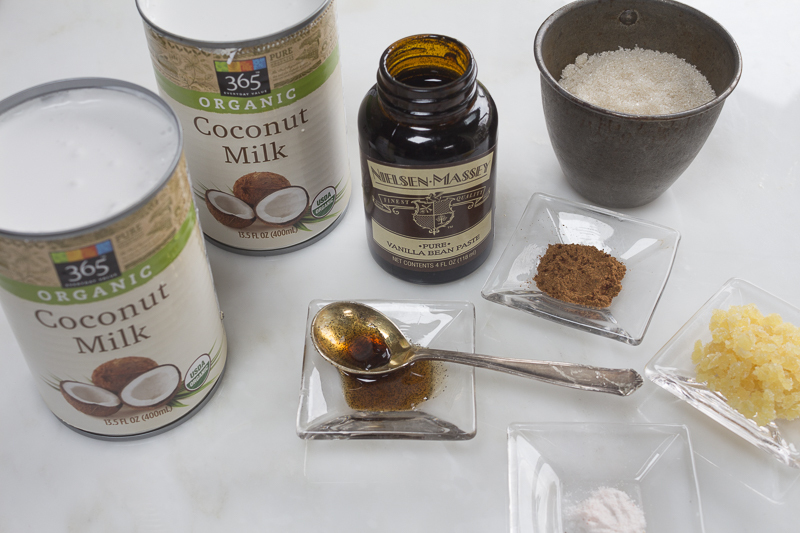 The ingredients are super-simple – Coconut Milk and Pure Cane Sugar are the main components. For flavoring, add vanilla bean gel (I’ll tell you where to find it in the recipe), crystallized ginger, pumpkin spices, coconut oil and a pinch of sea salt (try pink himalayan). These days, there are always lactose intolerant (who eat dairy-free) and gluten-free guests dropping by – this is the perfect treat for them, and honestly, I prefer it to fat laden vanilla ice cream. This vegan ice cream gives you a wonderful mouth feel, especially creamy with a caramelly – vanilla essence… vanilla bean gel in a jar packs a bolt of vanilla flavor, and the dots of bean are incredibly appealing. 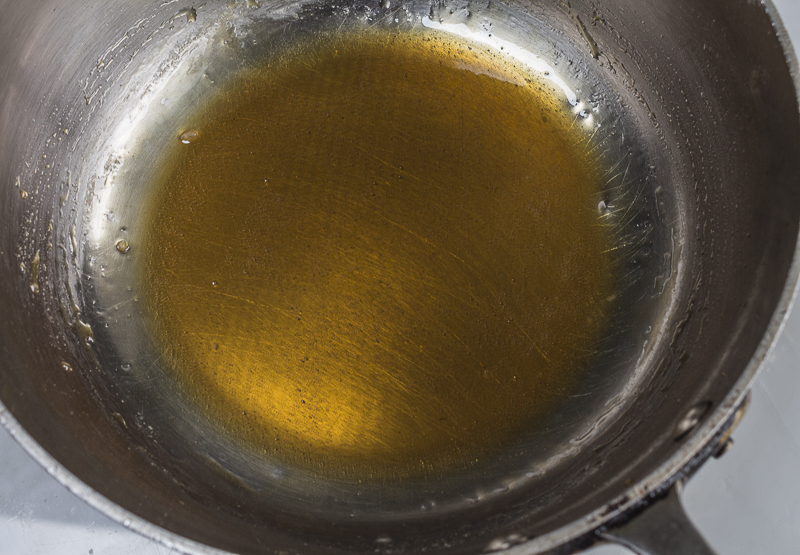 To add a layer of caramel-yum-flavor, “caramelize” the sugar first, by melting it in a heavy pot. 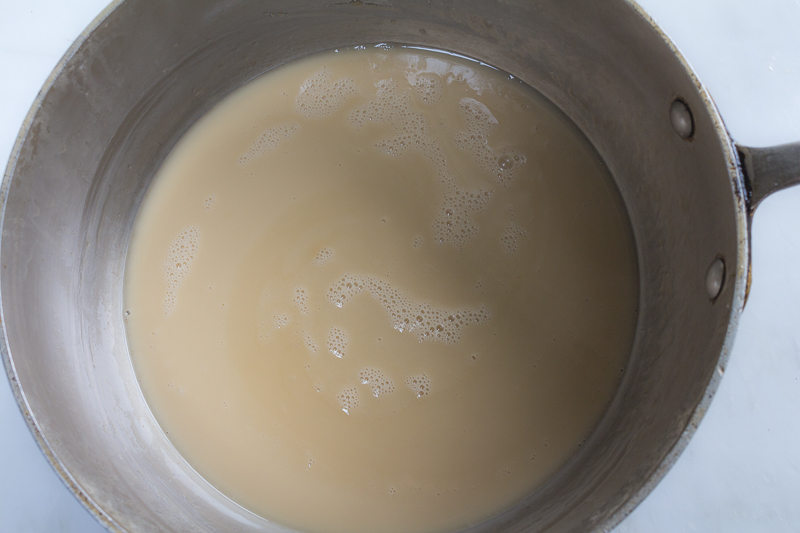 Then, the coconut milk is added, and the caramel will melt into the milk. The flavoring ingredients are added.. and that’s it! Cool & churn. Make ahead – then entertaining is a breeze. By this time, I have hopefully convinced you to purchase an ice cream maker! It is truly amazing the flavors you can imagine and whirl in your machine. I make heavenly sorbets and all sorts of ice creams, dairy and non- dairy. Have fun, and include the kids. 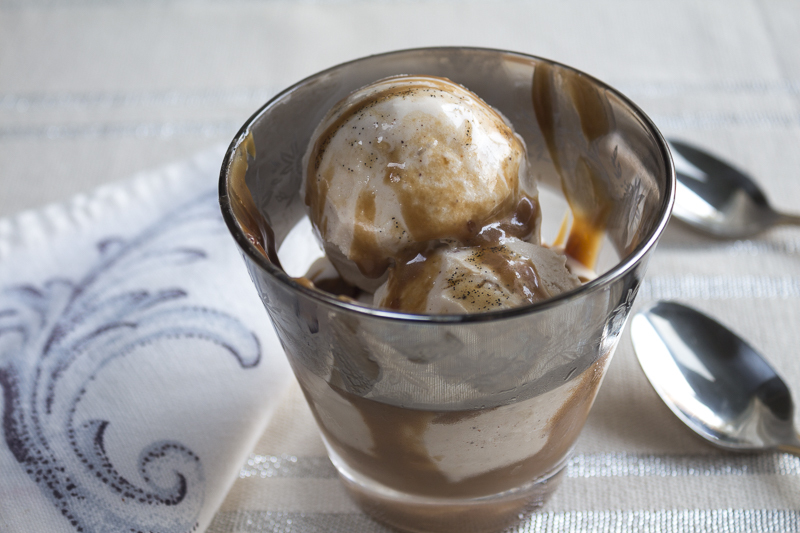 To Serve: A Parfait ~ Spoon some Caramel Sauce (recipe given) in pretty glasses, (I use short vintage beverage ones) and add a few small scoops of ice cream. 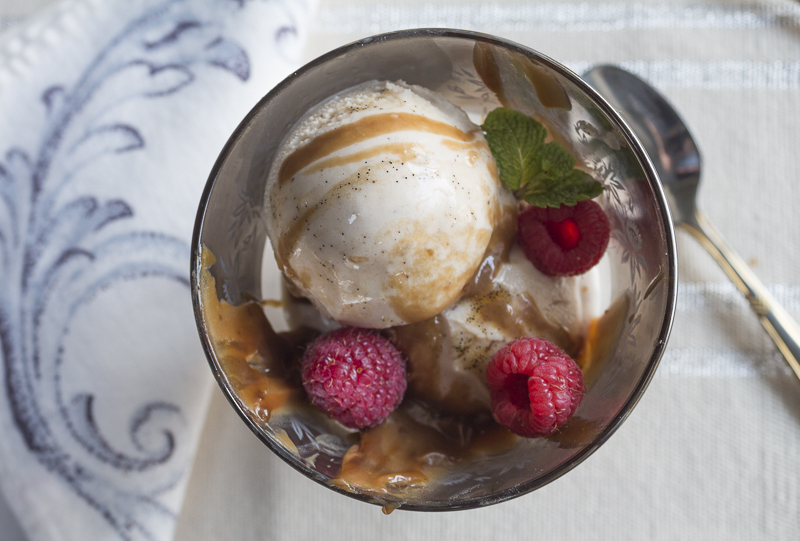 Add some raspberries for pizazz and a mint leaf… and some more Caramel Sauce on top. Also, serve a large scoop next to your favorite pie or cake if you like. It’s true that coconut milk contains a lot of saturated fat, but the fat in coconut oil- where the fat in coconut milk comes from – is slightly different than saturated fats that come from animals. These plant-based fats are medium chain fatty acids, which don’t degrade in the body the way animal fats do. Instead of adversly affecting cholesterol levels, they may actually lead to an increase of HDL – or good – cholesterol levels (might also raise your LDL as well.) Because the body does not store coconut fats, there is less chance that your arteries or blood vessels will clog, which lowers your risk of heart disease. Like coconut oil, coconut milk contains large quantities of lauric acid, which your body converts to monolaurin, a chemical which your body uses to help fight off viruses. While there is some evidence to show that coconut milk can have a positive effect on your health, the vast majority of the calories in coconut milk comes from the amount of fat. 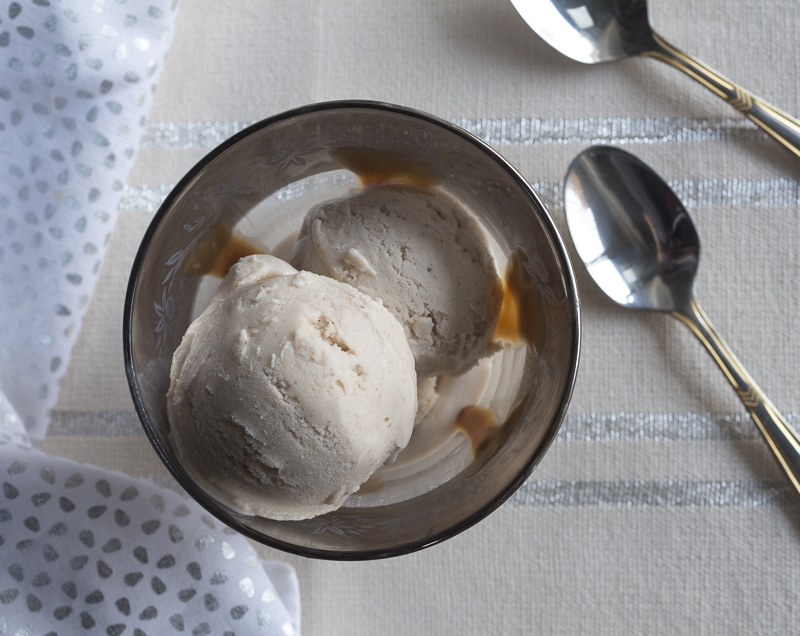 Enjoy this creamy treat – keep some in the freezer when guests drop by!